Slimming World has been providing lifestyle weight-management programs since 1969. The company supports 950,000 members across the U.K. and Republic of Ireland through weekly group sessions and online and has recently launched online in the U.S.
Slimming World’s program integrates practical, up-to-date advice with a highly developed support system based on care and compassion, and Consultant training focuses on facilitating behavior change in a warm and friendly group environment. Consultant training is delivered through the Slimming World Academy. Slimming World also invests in a comprehensive research program to develop its support for long-term weight management. The group support provided by Slimming World is recognized as effective by the National Institute for Health and Clinical Excellence (NICE) and the NHS. Slimming World’s overarching goal is to support those who want to lose weight while also improving their self-esteem and confidence. To achieve this, Slimming World’s PR team looks for ways to position the company as a leading authority in weight management. Facing a wide range of competition from weight management organizations, Slimming World places importance on increasing audience awareness of its unique approach to weight loss and demonstrating evidence of its effectiveness. “January is crucial for us. It’s a time when many people pledge to lose weight and, in a highly competitive market, breaking through the noise to make Slimming World the weight-loss method of choice is both a challenge and an opportunity,” said Jenny Caven, head of external affairs at Slimming World. Caven and her team planned a “Dream Weight” campaign, which aimed to demonstrate the company’s effectiveness at helping people achieve their dream weight. The PR team used a study from its in-house research team to help bolster the campaign. Published in the Journal of Human Nutrition and Dietetics, the study showed that people who set more ambitious weight-loss targets lose more weight than those who set more modest targets. The findings of this research were incorporated into its campaign, targeting national, regional and local media. The campaign was further supported with weight-loss success stories and social media activity, and was followed by ongoing PR and consumer-focused campaigns including the announcement of Slimming World’s ‘Mr Sleek’ and ‘Miss Slinky’ 2017. 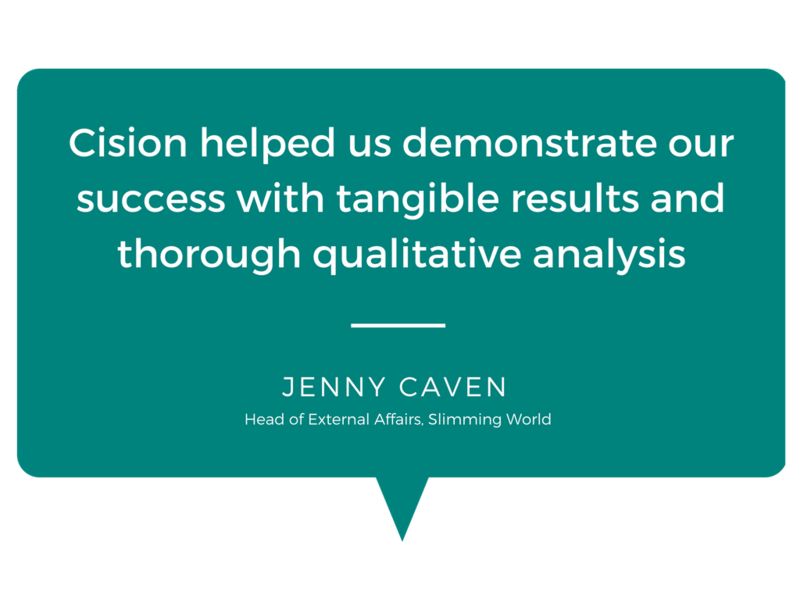 With the campaign design ready to go, Slimming World’s PR team needed a measurement framework in place to help track metrics before, during and after the campaign. “We needed to demonstrate the ROI of our efforts and prove that what we were doing was strategic and would meet our business goals,” Caven said. Slimming World worked with Cision Intelligence to integrate a variety of measurement and research techniques to evaluate the efficacy of the entire campaign. Cision’s team of analysts coded print, online and broadcast coverage for sentiment and relevant metrics, including the presence of campaigns, messages, spokespeople and impact measures. Coverage was measured for the six weeks prior and six weeks after Slimming World’s campaign launch. Cision worked with market research company, Opinion Matters, to survey a representative sample of 10,000 people making up target audiences for the campaign. The data was used to identify a key target media list for these audiences and was used to gauge the resulting reach to each audience. To better understand the campaign’s impact on Slimming World’s audience, Cision ran additional brand research via Gorkana Surveys, which asked specific questions relating to Slimming World, its reputation, and people’s propensity to use Slimming World for weight loss instead of other methods. The first one ran just ahead of a surge in proactive PR activity for the Christmas and January period. This was compared with results from a second survey, which ran six weeks later. Analysis explored changes in perception over time. How familiar are you with Slimming World? To what extent have the things you have heard, seen or read about Slimming World recently been positive or negative? Where do you place the reputation of Slimming World? How likely are you to use Slimming World? 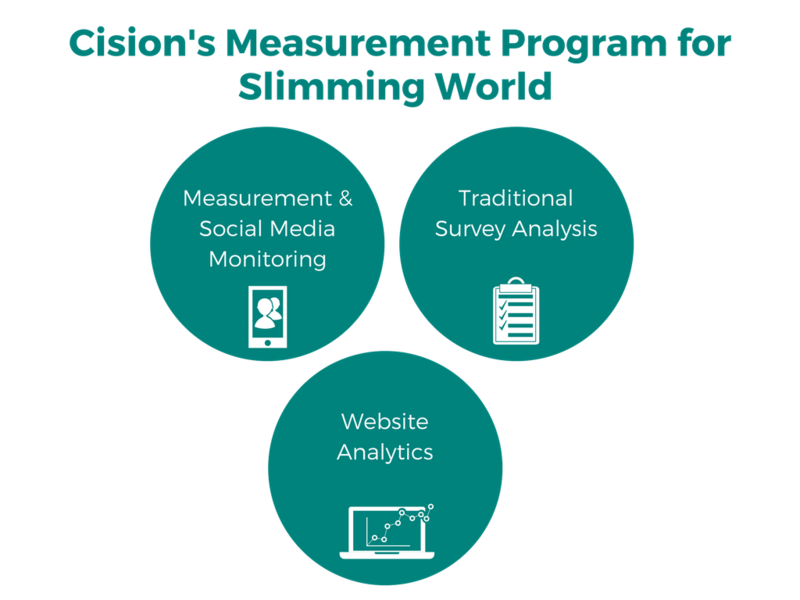 Cision and Slimming World used web analytics to measure how the campaign and earned media activities impacted web traffic and sign-ups. Website analytics were used at both a macro level, to understand overall changes in activity, and a micro level, to understand specific online journeys for individuals as they read online content, visited the website and searched for their nearest Slimming World group – which is often the last step before participants join. Media coverage for Slimming World increase significantly in both volume and quantity during the campaign period. The company saw 365 per cent more coverage in the six weeks following the “Dream Weight” campaign than the six weeks prior. “We were pleased to see that the majority of our earned media coverage delivered a key message and was positive in tone,” added Caven. The campaign increased its audience reach by 25 per cent, led by Slimming World’s appearance in targeted outlets such as the Daily Mail and The Daily Telegraph. The UKPulse data demonstrated that these were key media outlets for Slimming World to pitch, and also validated all media outputs. The follow-up “Miss Slinky 2017” campaign received international attention in U.S. outlets such as People.com, Inside Edition and Aol.com, which drove web traffic to the Slimming World U.S. site. “Using surveys helped us to pinpoint the media outlets that our target audience frequently read,” Caven commented. Familiarity with Slimming World’s products and services increased by eight per cent, and 45 per cent of respondents post-campaign said they would likely use Slimming World to lose weight. The biggest increase came from men, where positive perceptions increased by 13 per cent. 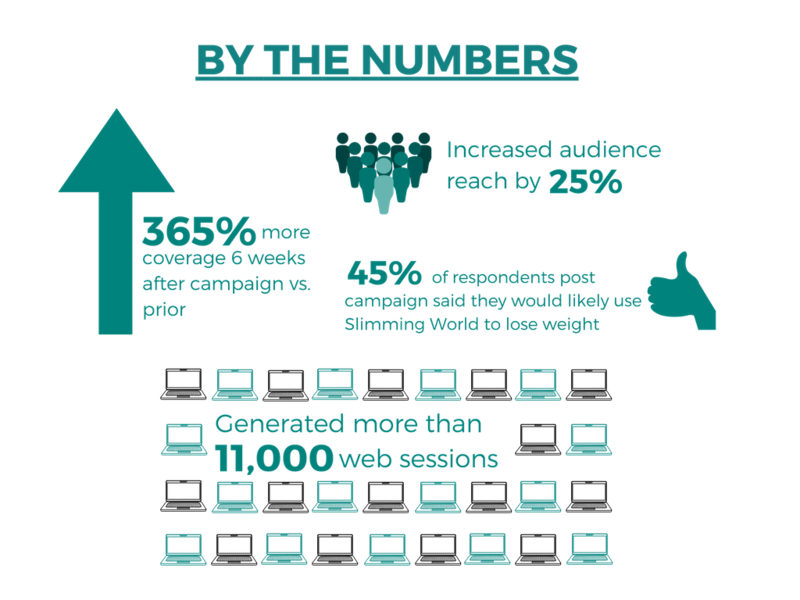 Coverage related to all campaigns generated more than 11,000 web sessions and an average web conversion rate of more than three per cent. Newspapers that ran menu plans and recipe extracts from Slimming World accompanied a free membership, which accounted for 50 per cent of all new members who joined Slimming World during the campaign month. “We also say membership increased by more than 17 per cent over the course of the campaign,” said Caven. Slimming World will apply its learnings from the “Dream Weight” campaign to future PR strategies. “As we continue to work to build our presence and raise awareness of our brand beyond the UK and Ireland, demonstrating how PR can drive results will ensure that earned media remains a key component of our paid, earned and shared strategy to enhance recognition, our reputation and business growth,” Caven concluded.